Ben carved out an evening for me, and took me for some fantastic sushi at Blue Fin. We met his friends Josh and Amanda, who are lovely people. I discovered that Sun has an local (probably a sales) office in Columbus! Not more than a mile from my house! With ~20 floating loaner-offices for use by remote workers! I'm going over there tomorrow to scope the space out. A Sun engagement (Solaris 10 Boot Camp! -- sounds like a 'My Nerd Teenager is Out of Control!' premise for the Maury Povich Show) took me to Cleveland's Case Western Reserve University last week. 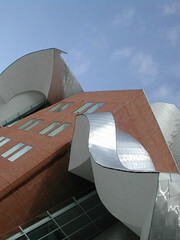 I took advantage of lunch hour to walk over and snap some shots of the Frank Gehry-designed Peter B. Lewis Building. It's acquired some notoriety of late. Not only does it confound SWAT teams, it also is trying to kill faculty, staff and students. For what it's worth, I think it's a beautiful building. And if a couple of smelly undergrads have to be ice-impaled each winter that the rest of us may enjoy it year-round? So be it. Everyone always asks me what it is like to have 1:1's with Gates, and the answer is not what most people expect. He's got two sides of his personality: a smart, genuine and very approachable geek (I found that surprising) and a hard-edged business guy (not surprising). I truly enjoy our interactions when we are in geek-mode. There is broad common ground on where things are going, what are problems with getting there, and why we need a relentless focus upon innovation. And let's just say I feel differently when his biz-mode kicks in. 'Nuf said. This page contains an archive of all entries posted to Soldier Ant in the Sun category. They are listed from oldest to newest. AOL is the previous category.